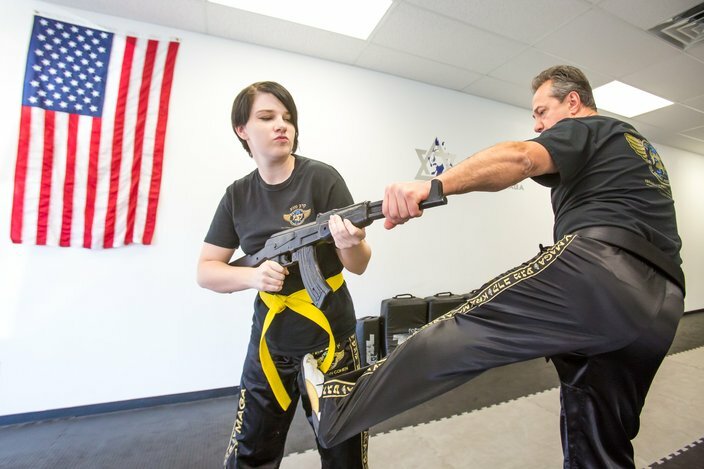 Cadence Perkins, owner and director of the Discovery Learning Center in Mays Landing, requires her employees to take 'Disarming Active Shooter' training every year at the nearby Performance Krav Maga studio. “If someone comes into your school with an assault rifle, you can assume you’re dead if you just wait for the police to arrive,” she says. It was the mass shooting in Newtown, Connecticut, where 20 children were killed along with six elementary school staff members, that convinced South Jersey daycare owner Cadence Perkins that her entire staff needed training on how to survive an active shooter. So all 20 staff members at the center take almost yearly self-defense classes on what to do if an active shooter decided to attack the school — including taking the shooter down. While FBI statistics show that mass shootings remain rare, there’s no denying that the nation has been shocked in recent weeks by scenes of carnage in Las Vegas, Sutherland Springs in Texas and Azusa, California, and that the numbers are rising. According to a recent FBI study on mass shootings, the number of incidents since 2000 has been trending upwards, peaking at 26 in 2010. In the past, the federal government defined a "mass shooting" as one that kills at least four victims. Another definition uses broader criteria: the injury – though not the deaths – of at least four victims. Others use criteria in between. Not all mass shootings are active shooter situations, which are defined by the FBI as "an individual actively engaged in killing or attempting to kill people in a populated area." According to the FBI, between 2000 and 2016, there were 216 active shooter situations, scenarios that are typically dynamic and evolve quickly and characterized by no pattern of targeted victims. Over that period, there were 13 incidents in Pennsylvania, including four in Philadelphia and two in Delaware County. Two incidents were reported in New Jersey. As the number of shootings has risen, interest in classes on how to survive an active shooter has spiked, according to area self-defense companies and security experts. Others, perhaps more disturbingly, are saying the shootings have become so regular, that taking a survival classes is now routine. “It’s kind of on people’s schedule now and they don’t wait for an incident” to request training, said Sgt. Joe Guerrier of the Hamilton Township Police Department in South Jersey. Guerrier, a member of the township’s SWAT team and an active shooter trainer, says the department has given roughly 30 classes since 2014 – at the Hamilton Mall, area churches, and government and office buildings. With discussions about how to survive an active shooter now a part of regular conversation among office managers, school officials and event coordinators, a range of businesses from multinational corporations to storefront self-defense schools are responding to the need for training. Thomson Reuters, which runs a global news organization, offers courses on taxes and accounting, legal issues and corporate governance. And, for at least eight years if not longer, a class on how to survive an active shooter. In the wake of the Las Vegas and Texas shootings, “we certainly did see an uptick with each event,” said a company representative, who asked not to be named because of the sensitivity of the subject. “I can tell you people get very intent on seeing the course, but very few are actually proceeding” with the online video class. After Stephen Paddock, armed with modified semi-automatic weapons, fired into a crowd of 22,000 people at a country music concert on the Las Vegas strip, killing 58 and injuring 546, operators of an outdoor venue in Pittsburgh approached Thomson Reuters about taking the course, but so far have not moved forward, the representative said. He couldn’t say why. The Thomson Reuters course follows the Run. Hide. Fight. advice generally given by the FBI and other law enforcement agencies (see video below). If confronted by a shooter, run if you can, hide if possible, and fight if you must. In addition to for-profit companies, area police departments, including the Philadelphia Police Department, offer public classes that offer strategies to survive in an active shooter scenario. Some area active shooter self-defense classes — like the one Perkins and her staff took — emphasize the fight part of that equation. 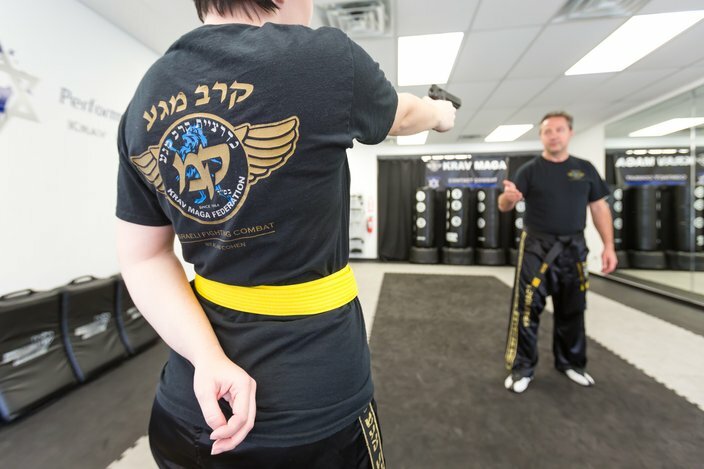 “I think people are coming to the realization that they could be in a situation themselves, ” says Greg Dziewonski, co-owner of Performance Krav Maga in Mays Landing. Here, he and student Rachel Himes demonstrate techniques used to disarm an active shooter situation. Greg Dziewonski, a self-defense expert, offers active shooter training classes, including one that was open to the public in September, through his Performance Krav-Maga studios in Mays Landing and Vineland. Unlike the Thomson Reuters class, his is hands-on. Dziewonski, who trained the teachers at the Discovery Learning Center, also follows the three-tier recommendations of law enforcement. The staff at Discovery Learning Center in Mays Landing undergo training every year with Greg Dziewonski at Performance Krav Maga. According to Guerrier, who also works with the ALICE Training Institute, a security company nationally recognized for its active shooter instruction, there has been “an evolution in the training in the last five years,” to emphasize fighting back, if necessary, when confronted with a gunman. For Perkins at the Discovery Center, which offers day- and after-school care for infants to elementary students, that means regular active shooter training for the staff.